Ideal for smaller fireplaces, the Valley Oak logs are featured on the G8 Vent-Free burner system. Simple in design and function, this reliable system includes a 9,500 BTU’s model designed for bedrooms (where permitted by code) or the standard 22,000 BTU model. A décor kit is also available to add to the attractiveness of your fireplace setting. The G8 Series is available for Natural or Propane gas in 16”, 20” and 24” sets, with BTU’s ratings of 9,500 or 22,000. Nothing compares to the experience of sharing the warmth of a fire. What can be more central to human connection and happiness than sharing a fire together? Real Fyre is dedicated to making that experience uncommonly beautiful, convenient, and pleasurable. 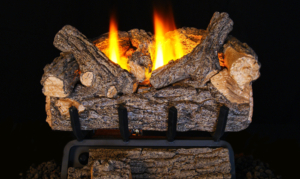 That’s why 65 years ago we pioneered natural looking gas fireplace products. And why today we still pride ourselves on providing the most beautiful hearth experiences you can have. Integrity and quality are the cornerstones of everything we do and everything we make. What we build, we build for people who value quality and integrity as highly as we do. That’s why no one in the industry puts more artistry or engineering into the process of creating your gas fireplace products. That same unmatched attention to detail and performance is also evident in our business relationships and our customer service.